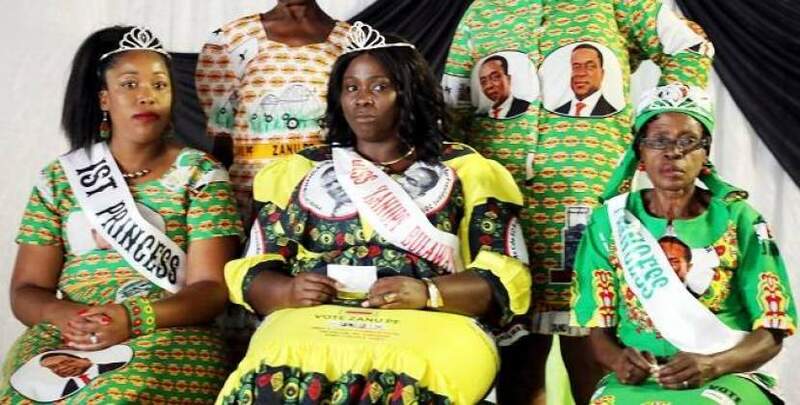 FORTY-two-year-old Nokuthula Sibanda was on Tuesday crowned Miss Zanu-PF Bulawayo Metropolitan province at a ceremony held at Davis Hall. The modelling contest that saw a 70-year-old making it in the top three, was held to select the province's representatives for the national finale. The finale will be held during Zanu-PF's 17th National People's Conference in Esigodini that will run from December 10 to 15. Sibanda beat six other contestants relegating Ruth Shelton (33) to first princess and Evelyn Nyambe (70) to second princess. Following her crowning, Sibanda, who is Zanu-PF's provincial secretary for transport, said she would do her best to represent the province at the national finals. "I'm confident that I'll bring the national crown home. The competition was very stiff as there were many talented ladies on stage who could've won the top prize," said Sibanda, a mother of three. She urged more women to participate in the revolutionary party's pageant. "This pageant encourages us to be clean and confident as women. I recommend more women to participate in these pageants organised by the party in future," said Sibanda. The competition was a mixture of old and young with winners being drawn from two categories, Youth and Women's League. The judging panel comprised Memory Baye, Helen Charimari and Dominica Mringi. The judges also selected the Top Youth League model and Women's League model. The top youth model was Shelton with Sibanda being the top women's league contestant. According to Mringi, Sibanda took the crown because she was well dressed and confident on stage. "When we were looking for a queen, we looked at a woman who walked with confidence and had stage presence. In all categories, the queen took the cup — her attire was on point and you could see that she matched everything from her shoes to dress and jewellery," said Mringi. Ahead of the national finals, Mringi said Sibanda and her princesses would be taken for grooming and deportment lessons at the Ministry of Women's Affairs, Gender and Community Development offices at the Mhlahlandlela Government complex in Bulawayo. Among the delegates who watched the contest were Zanu-PF Bulawayo provincial Women's League chair Eva Bitu, central committee members Cdes Molly Mpofu and Anna Ngwabi.